Easy installation - less than 5 minutes! The Cinch is the most affordable, easy-to-use, and minimalistic snowboard wall mount on the market. Designed to be easy-to-install and easy-to-use, the Cinch is everything you need in a snowboard rack in an ultra-affordable package. At the core of the Cinch are the abrasion-resistant SBR rubber bumpers. These bumpers provide a sturdy and rigid way to secure your board in place, but are soft enough to be safe for your board's edges. The Cinch is designed to hold your board vertically and flat up against the wall. This means it takes up practically no more space than your snowboard! 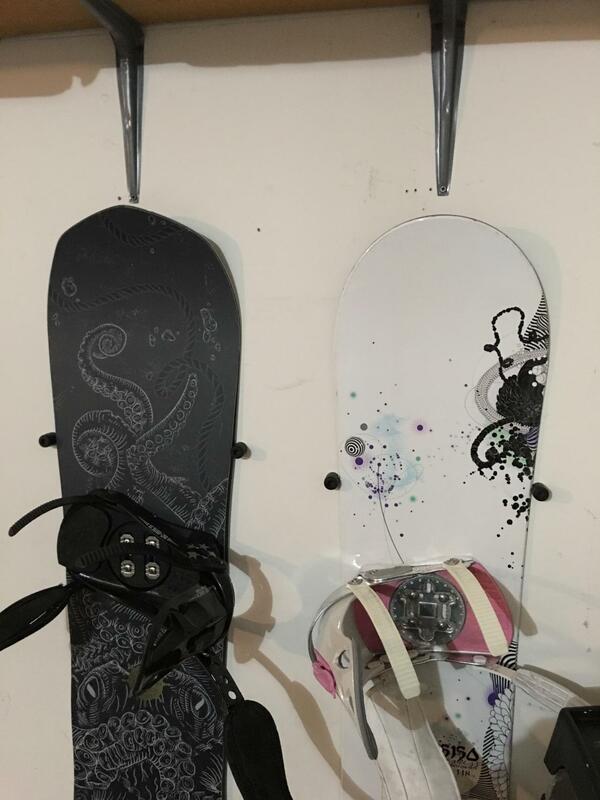 You can store your snowboard with or without bindings attached. This means it is a great way to show off your board AND be a quick-access storage rack for your daily rider! 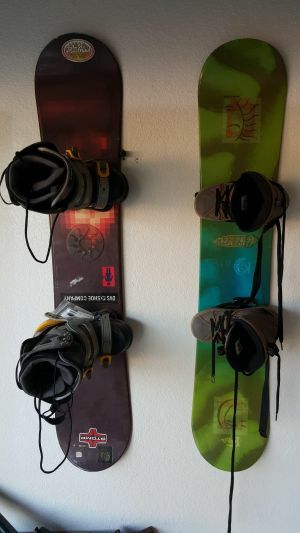 Hey, this is Josh from StoreYourBoard, here today to talk about the Cinch Snowboard Wall Mount. Here is it behind me and here it is what’s actually included in there. It’s a very minimalistic rack but it looks awesome on the wall. What’s included are two rubber abrasion-resistant plugs. You got two drywall anchors and two screws. The way it works is you just lift it out and out, so we got two plugs mounted there. Put your snowboard in like this. Drop it down, and there it is! Awesome! The way that we can do that is because almost all snowboards have an hourglass shape where if you look at the top common snowboard, it’s wider on the tip and the tail than it is in the center. So we use that fact and these rubber plugs to make this very simple mount that’s super minimalistic but does the job, holds it on the wall nicely. The way we do that is you need to measure your board at the tip, so here we’re talking about you know this is about 11.5, 11.5 at the tip and then where we usually tell people to mount them is right above the bindings. That’s typically a good mounting spot. So on this board, we’re talking right about 10.5 there, so you see there’s about an inch difference and that’s all we need to make this work and then it’s even skinnier here in the very center. It’s about 10 inches. To do this, you want to take that measure. We have about 10.5, so I have some predrilled holes here already. We include the drywall anchors, so feel free to use those. Our set here is all wood, so we just drill right into it. The key thing to note though is because the hole is in the center of this rubber stoppers, you actually need to add 3/8 to each side or 3/4 total, so right here, I got 10.5; I added 3/4. What you do is take your drill. You can do it with a power drill or just a regular hand screwdriver. Put the screw inside the rubber stopper and go ahead and drive it in. Great like that. You’ll know that the screw is actually in-set in this. You want to make sure it’s nice and snug but you don’t want to drive it too hard. With some of these power drivers, you can basically drive it right through if you’re trying. Go ahead and put the other one up. There we go. Easy as that, so that’s what looks like on your wall without the snowboard in. Then you go ahead and take your snowboard. Like I said, you want to put it in where it’s thinner and then drop it down so it catches where it’s wider right like that. There it is. Awesome, awesome snowboard mount. It looks super great and you can kind of bring it out from the wall on the stoppers a little bit, so you don’t really mess up, mar up your wall, so there we go.The Cinch Snowboard Mount from StoreYourBoard. Thank you. Can this be used for storage during the season, where the board will be taken down and put up throughout the snowboard season? Yes, our Cinch Snowboard Wall Mount is designed for use by boarders who are actively riding; it gives quick access for daily/regular use during the season! 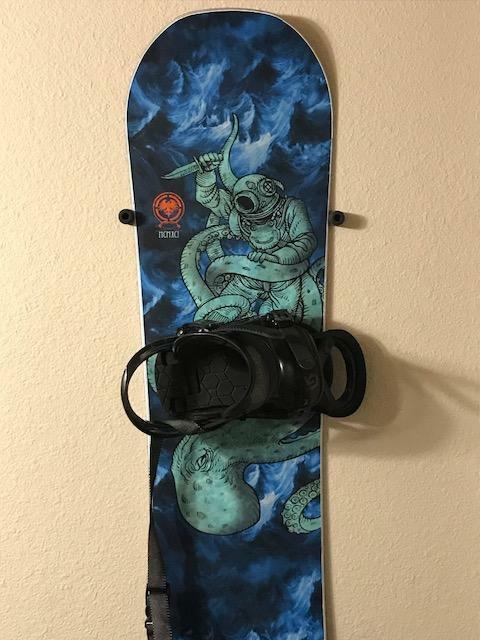 My question is regarding installation: would the mount work the same way if I am planning on hanging my board at an angle? Instead of straight upright, as it seems most if not all of the reviews have done? The Cinch snowboard mount is really best mounted straight up and down (vertically) as shown. That is really the only way it will hold your board securely. Could this rack be used to mount a backboard? If not do you have any vertical mounts for wakeboard? This may be similar to another question asked but could you hang a skimboard with this product since its thinner than a wakeboard? Our Cinch Mount won't work for a skimboard, because it isn't shaped like a snowboard. The Cinch works with a snowboard's hourglass shape, where it is skinnier in the middle and wider at the tip and tail - it uses that shape to cinch the board in place, as seen in the video. Can these cinch mounts be drilled into a brick wall with the screws provided? 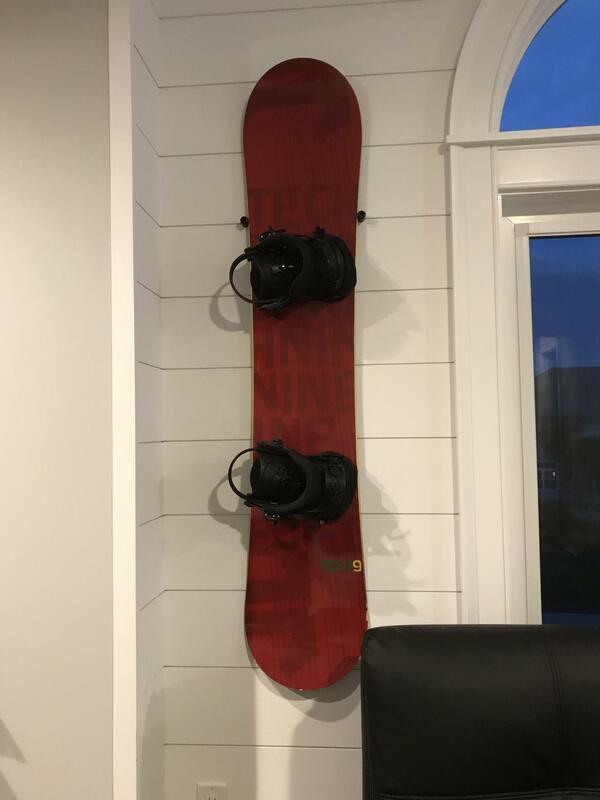 Our Cinch Snowboard Mounts come with standard mounting hardware for installation into wall studs (with provided wood screws) or drywall (using the included drywall anchors). To mount them into a brick wall, you would need to purchase brick/masonry anchors, from anywhere that you buy hardware (Lowe's, Home Depot, etc.). You can find some additional general guidelines and tips here: mounting wall and ceiling racks. 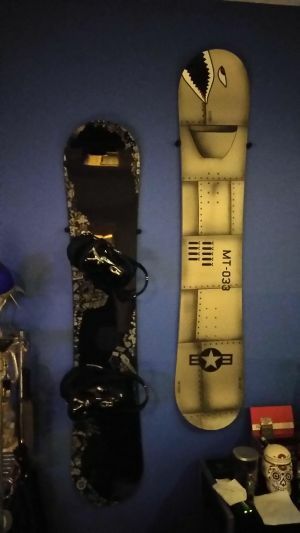 Looking to display a old wakeboard vertical with topsheet showing, no bindings. Will the cinch work or the floating? Unfortunately, neither the Cinch or the Floating Deck Display will work for your wakeboard. The Cinch works with the shape of a snowboard, which is different from a wakeboard, so a wakeboard just won't sit right in the Cinch system. The Floating Deck uses a snowboard's binding inserts to mount the board and works mainly for standard snowboard binding insert patterns, so doesn't work for wakeboards. Is it possible to use these with ski's too? The Cinch Snowboard Mount does not work for skis. It s designed to work with the shape of a snowboard, and so won't be able to hold skis. We have a variety of ski mounts, seen here, for your consideration. How far does the rubber piece stick out from the wall? The rubber piece sticks out about 1 inch from the wall! Clean and easy, great look and safe for my rides. A great way to show your board and save space. Simple design and super easy to install. Easy to store board, easy installation. Easy installation and love the minimalistic look! This snowboard holder is so easy to use and unobtrusive. Love the clean look. I've purchased these twice, once a few years ago, and again just a few weeks ago. They are easy to install and work great. The only slight drawback is the included wall anchors sometimes break. But I happened to have other, more sturdy, anchors on hand (left over from some other project) and the rest of the components (the screws, the rubber piece) were compatible. Does the job and looks great. These are the best little holders ever made.!!! Thank you very much!! Simple product that gets the job done. Didnt want all the extras going onto my wall just basic install and use. Displays boards very well and holds them properly. Only thing I would like to see as a possible option is colors for the runner mounts to further personalize your wall set up. It was exactly what we needed. Very easy to install and the snowboard looks great on the wall. This took no time to install, works great, and looks good. My only complaint is that the anchors BOTH broke and I had to go dig some new ones out of the garage. I'm not used to the self-drilling kind and I think I put too much pressure on them. If you let them drill themselves in slowly I think they'd be fine. They arrived very quickly, were easy to install and worked perfectly, my boards look great on the wall! I bought 2 wall mounts and they are exactly what I needed. They are great! Product worked perfectly as shown in online pictures and it was so easy to install. The Cinch at such a Price! Excellent product with an unbeatable price. Makes the snowboards look good hanging with this mount system. Easy to install. Not designed for plaster walls!! I have plaster walls and the anchor bolts are not strong enough to hold the screws in. I screwed the pin tabs to the wall and was like instant art display - absolutely amazing! They are easy to install and have held up thus far. However, the drywall anchors are thin plastic and bend and break if you try to manually screw them into the wall without a drill. This is a product that I could easily make myself for cheaper just by going to my local hard ware store. But it came with stickers so that's cool. Easy install, cheap and works great. Definitely will recommend to friends. EASY TO INSTALL, GREAT PRICE! Our snowboards have been living against one wall of the garage, and I have to remind folks (mostly my kids) as they get in and out of my truck to be careful not to bump into them or they'll slide down and fall over. These wall mounts were perfect to get them up off the floor and out of the way. I did have one issue: the tip of the wall anchor (one of them) broke off in the sheet rock as I was screwing it in. I got some needle-nose pliers and extracted it, and decided the remaining portion of the wall anchor would probably be enough to still do the job. And so far so good. works well and is simple to install. Good stuff. Delivery only took 48 hours from when I placed the order. I didn't use a level. I just eyeballed it and it works just fine. This was exactly what I needed. In an apartment with a smaller bedroom getting my board off the floor and out of the way was a must. The Cinch works great and is easy to install. Board was mounted in 5 minutes! Exactly what I was looking for in price and function. Very nice for upright mounting, sturdy and easy to hang. Good product. I don't consider myself handy at all, but they're fairly simple to install. Only issue I ran into was that 2 of the dry wall mounts that came with my order broke during instalation and that caused some issues for me. All in all good product would recommend to others. I painted my snowboard with chalkboard paint and hung it to use as art display. This hardware is easy and minimal. Perfect. Surprisingly easy to install and easy to use wall mount. Effectively hangs board tightly and flat against the wall for a dirt cheap price. The mounts installed in minutes with a drill and a level. Now my bedroom has unique style and easy access to my shredstick. Simple two screw installation. Basic, Easy, and friendly on the budget. Great set up to display your stick. Easy in and looks great. Amazing for the price!! its name says it all ! its a cinch and simple to install . great idea ! great idea! the name says it all its a cinch and simple to install. Looks good in my man cave and cheap to boot. At first I was hesitant to pick these up because you can pretty much find everything at the hardware store. Decided to order them anyways and I'm happy I did. The rubber pieces are really the key.